ORIGINAL ISSUES OF "THE SPORTING NEWS" AND INCLUDES A FEW COVER SHEETS ONLY. ALL IN FAIR TO GOOD CONDITION. Lot of 6 includes: February 1972, June 1972, September 1972, November 1972, April 1973, and September 1973 issues. Loads of great photos and nostalgic stories. Interesting tidbit regarding April 1972 issue with letter to editor from Keith Olbermann from his youth ( see photo ). Fair condition, wear, tear, writing, as is. See pictures. 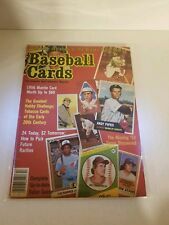 Sports Magazine Lot of 16. Up for sale is a lot of 16 Sport Magazines from 1986-1987. The magazines are in great condition with no major flaws whatsoever, see pictures for details. November, 1963 - Whitey Ford on cover. Overall in good condition. Covers with light wear. Front cover with center crease. Back cover with creases next to spine. Light chipping to spine. 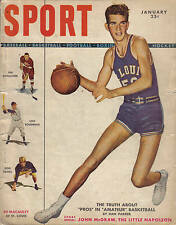 March, 1963 - Bob Cousy on cover. The magazine contains great photos from the 1969 NFL-AFL season as well as an in-depth preview of the upcoming 1970 season. 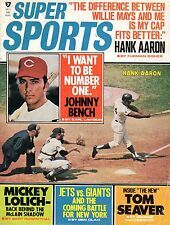 Sports Stars of 1970 Magazine. Pro Football. 1970 Season Player Profiles. Nice addition to any collection - nostalgic reading. 1975 SPORTS REVIEW WRESTLING MAGAZINE. This item is a must have addition to any collection. New ListingMickey Mantle - SPORT Magazine, October 1963 - Vintage. Yankees, Wow! Yankees, Wow! Magazine is in overall good condition. Light reflection from cover photo is from the clear poly magazine bag. Nice addition to any collection - nostalgic reading. 1976 SPORT WOMAN MAGAZINE. This item is a must have addition to any collection. April 1972 Sport Magazine BOSTON BRUINS Bobby ORR. Magazine in excellent condition. 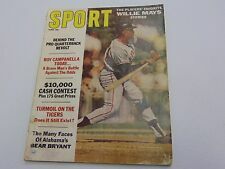 Original Complete 1953 Sport Magazine October issue with Roy Campanella of the Brooklyn Dodgers on the cover. Magazine looks to be in EX condition. No missing pages. Tight spine. Very nice. The magazine in the scan is the one you will receive. Pages are tight and clean. Still a nice old collectible magazine. 1957 SPORT MAGAZINE PAUL HORNUNG HOF NOTRE DAME ALL AMERICAN QUARTERBACK EX. A great color collectible for any SPORT MAGAZINE, PAUL HORNUNG, BALTIMORE COLTS AND QUITE A NUMBER OTHER PROMINENT SPORTS PHOTOS FOR THE COLLECTOR. 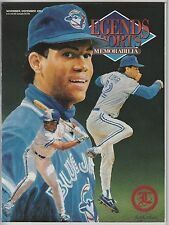 Sport magazine is noted for its beautiful color photos which are great for framing. Sport Magazine December 1986 Special Collector's Edition. Magazine is in good to very good condition. Complete, no torn or missing pages. Shows signs of lite use. Charlie Hustle, Superstar. The World's Fastest Human, Steve Williams. Calvin Murphy. Gaylord Perry Splitter Stories. Rick Wise Makes Waves on the Mound. Sports Review Series collectible magazine of Wrestling's Greatest Battles from July 1977. 5-BASEBALL NEWS 1969 CORD SPORTFACTS-LOU BROCK. January 1957 SPORT Magazine with Kansas Jayhawks center and basketball legend Wilt Chamberlain NM on his FIRST COVER of any sports publication. Magazine is in VG condition lays flat fully intact solid spine collectors copy! Magazine will be shipped in a polyurethane bag with rigid backing for safe and secure shipping. FREE SHIPPING! January, 1966 - Charley Johnson on cover. Overall in good condition. Covers with light wear and creasing. Lightly pencilled price near top of front cover and lightly inked circle on back cover. Chipping to spine.